NutraGauze - 4 x 4"
Dermagran-B Hydrophilic dressings provide either a primary cover or filler for chronic and acute wounds. Supplied in two forms - impregnated gauze and tube - both contain Derma Sciences zinc-nutrient dressing formulation and balanced pH technology, providing a moist, mildly acidic environment conducive to wound healing. In addition these products contain Vitamin A, Vitamin B6, calcium and Magnesium. Use for management of pressure ulcers (Stages II - IV), tissue trauma, surgical incisions, partial thickness thermal burns, diabetic and venous stasis ulcers. The first time I ordered this item it was great. The second time I ordered this item it was defective. The compound had separated and came pouring out of the tube in liquid form instead of a solid or gel/cream form. I filled out the return application and haven't heard from Allegro since. 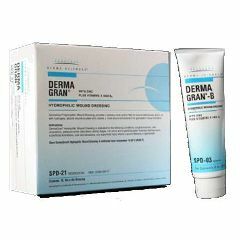 I ordered a different product to tide me over but it doesn't have the same properties as the DermaGran B. Maybe if you read this you can get this matter resolved. I want to return the 2 defective tubes and have them replaced with the same product which will hopefully be in tact. Promotes Healing. Easy To Use. Safe. Effective. Have to cut to size. Long Term Use. Heart surgery stab wounds. The drainage stab wounds on my chest would not heal. Here I was 5 months after surgery with horrible wounds. I was sent to a wound doctor until they became superficial. This product is what the wound doctor used on me and sent me home with one envelope. I immediately looked it up and found Allegro Medical. Now I can get my dermagard and stuff for my elderly mother. Promotes Healing. Effective. Easy To Use. Safe. I just wanted to write and say how pleased I am with my order, and how quickly I received my merchandise. You will certainly be getting my business from now on. As a matter of fact, I have already placed another order, for another product. I thank you so much, for the merchandise and the quick service.